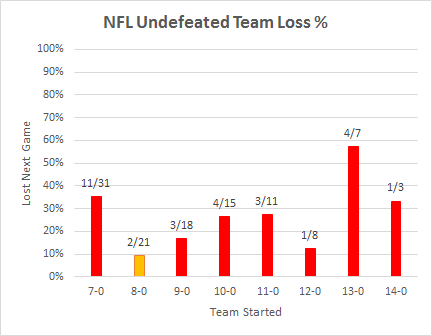 Very interesting graph about when an undefeated team tends to lose their first game, thanks, glad to see you publishing on here again. Re: DUCY, because 9-0 teams are more likely to have to play the team with the 2nd best record in the conference in the Division Round? The Giants are favored by 3 agsniat the Falcons and yet nobody thinks that they can win. I don’t understand it, how are they favored if no one thinks they can win? Eli is playing the best football in his career and players are not fearing him enough. There is plenty to be afraid of and the Giants are going to show the world this weekend!! !